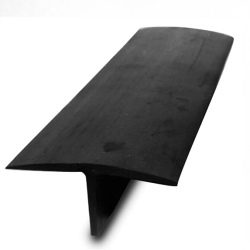 Pit T-Strip Extruded Rubber Molding--Standard Features -- Designed for use in truck scale applications to prevent spill-over into the pit -- Impact, tear, and weather-resistant SBR rubber. 80 foot length piece. Price includes LTL ground shipping (cont'l US) on a pallet to a business address with loading dock for forklift.